Barstools and home bars with French inspiration. Handcrafted bar stool with nail head trim. Hardwood frame. Upholstery: rayon/polyester; rayon. Handcrafted swivel barstool. Birch frame. Top-grain leather upholstery. Nailhead trim. Bar stool with velvet seat. Hardwood frame. Handcrafted barstool. Alder wood frame with dark-walnut finish. Polyester/rayon velvet upholstery. Handcrafted Alain bar stool with diamond tufting. Cotton and rayon shantung upholstery. Foam padding. Solid pine frame Upholstered barstool sold individually. Peruvian oak and Chilean pine frame. Linen/cotton upholstery with European burlap trim. Featuring plush velvet upholstery, polished brass legs and a plump silhouette worth sinking into, this design recalls a vintage Italian classic, crafted to accommodate guests over lingering dinners. With a brass handle on the back, its transportable profile is equally suited for sipping cocktails in the lounge. Featuring plush velvet upholstery, polished brass legs and a plump silhouette worth sinking into, this design recalls a vintage Italian classic, crafted to accommodate guests over lingering dinners. With a brass handle on the back, its transportable profile is equally suited for sipping cocktails in the lounge. Handcrafted barstool. Maple frame. Bonded-leather upholstery. Swivels 360 degrees. Swivel bar stool in bonded leather. Select maple hardwoods frame. Handcrafted bar stool with full aniline leather seat. Hardwood frame. Brass nail head trim. Our Calais Barstool is deeply cushioned and richly upholstered in top-quality fabrics. Antique-bronze nailheads outline the seat and back, and the gently curved legs are hand finished in a handsome espresso. Handcrafted bar stool. Custom select hardwoods. Bonded leather upholstery. Full-bearing swivel seat. Mortise and tenon construction. Adjustable leg levelers. Fully integrated back support. With their curved backs and woven rush seats, our Isabella Barstools offer comfortable seating at a kitchen counter or bar. Inspired by a piece discovered in a Parisian flea market, this classic bistro stool is available in an array of mix-and-match finishes, both gleaming and matte. Sensuous oval back done in Rococo-Revival style, with clean-line modern base. Durable, but portable, with excellent design range. Convenient foot rests. Inspired by a piece discovered in a Parisian flea market, this classic bistro stool is available in an array of mix-and-match finishes, both gleaming and matte. 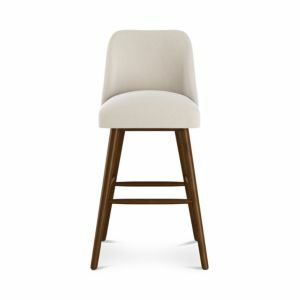 This hand-upholstered bar stool from Sparrow and Wren features subtle curves and understated lines that evoke timeless mid-century style. This hand-upholstered bar stool from Sparrow and Wren features subtle curves and understated lines that evoke timeless mid-century style. 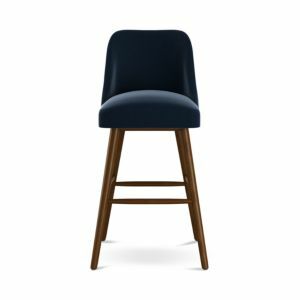 This hand-upholstered bar stool from Sparrow and Wren features subtle curves and understated lines that evoke timeless mid-century style. Handcrafted swivel counter stool. Birch frame. Top-grain leather upholstery. Nailhead trim. Sized to pull up to a kitchen counter or counter-height table, this counter stool has a distinctive metal grillwork inset back panel in a graceful swag design. The warm gold tone of the back panel is repeated in subtle metal feet and a metal accent collar on the square tapered front legs. The neatly tailored seat and back are finished with self welting Counter height stool featuring upholstered back. Rubberwood frame. Linen/rayon upholstery. Handcrafted pleated counter stool. Upholstery: Oyster is polyester. White/Black and Pewter are polyester/viscose/nylon. Solid pine frame. Swivel counter stool in bonded leather. Metal frame and seat back. Handcrafted barstool and counter stool. Wood frame. Belgian linen upholstery. Arrange these well-designed stools along a kitchen counter or island to create a more casual dining spot that's well-suited for breakfast with your loved ones. A plush curved seat complements a cool, clean-lined iron frame, making this stool a comfortable perch to set around your island counter. Handcrafted counter stool. Custom select hardwoods. Bonded leather upholstery. Full-bearing swivel seat. Counter stool with velvet seat. Hardwood frame. Seat upholstery: rayon/polyester. Seat back upholstery: rayon. Swivel counter stool in bonded leather. Select maple hardwoods frame. This counter height island provides plenty of serving and prep space on its natural stone top which conveniently overhangs on one side to accommodate stool seating. Ample storage includes five drawers, two fixed shelves and wine bottle storage with an adjustable shelf. The swooping seat of this stool is supported on metal-toned tapered legs inspired by the Italian modern classics of the 60s and 70s. The stool is scaled to fit neatly under standard height bars. Mid-century silhouette tempered with European simplicity, this counter stool is softly curved for lumbar support, yet minimalistic in its aesthetic. The low back makes it easy to slip under the bar when not in use Finished in Riverbank, this stylish 70" home bar features glass stemware holders, wine racks, and plenty of storage shelving. With lots of storage space, decorative panels and molding, it's sure to be appreciated for its form and beauty. A stylish alternative to built-in cabinetry, the Modular Bar Buffet organizes, stores and displays your entertaining essentials. Our Modular Bar System is a stylish alternative to built-in cabinetry. Expertly crafted with a solid mahogany frame. A stylish alternative to built-in cabinetry, the Modular Bar Buffet organizes, stores and displays your entertaining essentials. The left side features a mirrored back with large glass shelves and stemware storage while below their are wood shelves and ventilation and wire management for storage purposes. The right side features a plethora of shelves that can be used as bottle storage or turned over for flat display shelves. The overall finish is a rustic, warm walnut with physical distressing while the front and sides are wrapped in an ebony metal. The case is highlighted with generously sized hinges and metal door pulls. Their is a touch light control on the back of the cabinet to control the interior lights. A stylish alternative to built-in cabinetry, the Modular Bar Suite organizes, stores and displays entertaining essentials. Handcrafted bar cabinet features carved palm leaves on doors. 53.5"W x 20"D x 75"T. Built of pine solids and veneers with white finish; golden metal base. Two doors open to interior finished in soft taupe. Inside: white marble work surface; one felt-lined drawer with dividers; two scooped-out shelves for wine bottle storage; two adjustable shelves on each side; mirrored back with hanging wine glass holder. 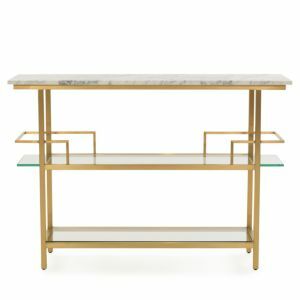 The refractive Lucite and gleaming cast brass of this bar cart are meant to catch the light, drawing all eyes to the clean lines of this Deco-inspired piece. This luxe, marble-topped bar cart boasts a built-in ice bucket and plenty of space to store - and display - bottles, glasses, and more. Handcrafted bar cart. Tubular steel frame with champagne finish. Three glass shelves. Bottle storage on both ends of bottom shelf. Casters. Handcrafted bar cart. Brass-finished stainless steel frame. Three glass shelves. Handcrafted bar cart. Iron frame; teak shelves. Multitiered, this antiqued brass bar cart offers extensive opportunities for styling. Perfect for parties, the black glass tray top is removable, taking martinis on the go This modern square bar cart is the perfect accent piece. It is a beautiful gold color with black leatherette trays. Style it with your favorite lamp, books, glassware, and decor pieces. Classic tulip shaping in textural cast-aluminum makes for a modern bistro table. Finished in raw nickel to bring out alluring highs and lows. Sliced and polished agate martini table with polished nickel base. Handcrafted antiqued mirror with grand floral etched pattern. Framed in round decorative tray. Ideal wall décor. Glass/wood. Handcrafted folding tray table legs. Metal frame. Handcrafted side table. 10"Dia. x 21"T. Brass and acrylic. Handcrafted baluster side table. Solid crystal. Glued base. Handcrafted side table. 12"Dia. x 24"T. Brass and acrylic. Vintage-spun sophistication adopts a fresh feel. A candlestick-style pedestal table is finished in an antiqued brass, offering a handy extra surface where needed. Perfect solo or in pairs Handcrafted side table. 16"Dia. x 24.75"T. Marble and brass. Lucite® tray. 18"L x 14"W x 3.75"T. Polished-brass accents; mirrored surface. This circular tray is a stylish addition to entertaining, with an embossed shagreen finish and two rectangular integrated handles made of brass. Its compact size is perfect for carrying drinks or organizing a home bar in smaller spaces. Handcrafted embossed shagreen textured resin tray. Brass handle details. Suede lining. Resin makes this easy to care for. Resistant to water.